PITTSBURGH — Nobody rocked a cardigan sweater better than TV personality Fred Rogers. The beloved Presbyterian pastor hosted the nationally syndicated TV show Mr. Rogers’ Neighborhood for 33 years on PBS. He began each episode by changing into his sneakers and putting on a cardigan before teaching children lessons of unconditional love and empathy as he interacted with his neighbors. Today, over a hundred PC(USA) churches honor his legacy of sweaters, neighborliness and compassion by participating in the Mr. Rogers’ Neighborhood Sweater Drive, a nationwide program that invites various organizations to collect sweaters and distribute them in their own neighborhoods to the people who need them. 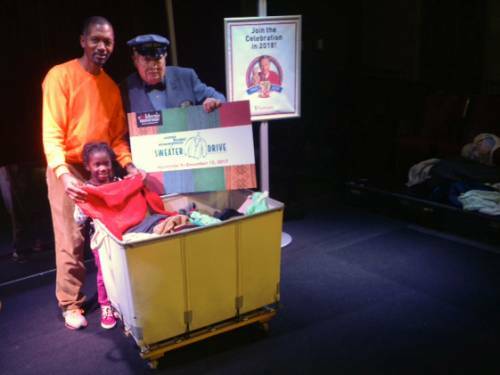 Presbyterian Media Mission and the Pittsburgh Children’s Museum kicked off the drive in the Western Pennsylvania regional event at the museum on November 9 with a special appearance by Mr. McFeely, the postman from Mr. Roger’s Neighborhood who always had a speedy delivery. This year Gregg Hartung, executive of Presbyterian Media Mission, expects over one hundred PC(USA) churches across the United States to participate in this year’s drive. Many of churches that participate are clustered around the Pittsburgh area, Mr. Rogers’ hometown. Hartung says the drive exemplifies the way Rogers lived out his faith. The newly re-named Unity Presbyterian Church in the Greentree neighborhood of Pittsburgh has participated in the sweater drive on and off for ten years. To kick off the drives at Unity, the Rev. Dennis Molinar opens worship by imitating the beginning of the Mr. Rogers’ Neighborhood TV show. He exchanges his shoes for sneakers, dons a cardigan and talks about the sweater drive as a way to follow Jesus’ command to show love to neighbors. Unity collects about 100 sweaters a year, sorts them and distributes them in the food pantry that is affiliated with the 400-member congregation. However, the sweater drive can work well in small congregations, too. The Rev. Bob Goossen leads the 70-member Crestview Community Church in Callery, Pennsylvania. He says one of the reasons the sweater drive is popular with his congregation is that the sweaters stay local. Contact local organizations to see if they need sweater donations. Download the Mr. Rogers’ Neighborhood Sweater Drive graphic and promote the event in worship, in bulletins and newsletters as well as on social media. Invite volunteers to help sort and deliver the sweaters, emphasizing connecting with others in the community. Designate a place in the church for sweater collection. Sort and deliver the sweaters at the end of the drive. Molinar says the sweater drive gets the congregation thinking about the community outside the church walls. Sue Washburn is the bi-vocational pastor of Reunion Presbyterian Church, moderator of Redstone Presbytery and a freelance writer.